Many visitors and locals enjoy seeing otters. Otters are one of the key species that wildlife enthusiasts hope to encounter on Mull, and arguably there isn’t anywhere better to find them. The Isle of Mull has over 300 miles of coastline, a lot of which can support otters, hence the island has one of the highest densities of otters in the country. Mull has a wide range of other fauna and flora, making it a nature-lover’s paradise. Otters are sensitive to environmental changes and disturbance so please read our guidance on how to watch them responsibly. Mull Otter Group do not reveal the locations of otters, as this may give too much attention to certain otter territories, and hence cause disturbance. 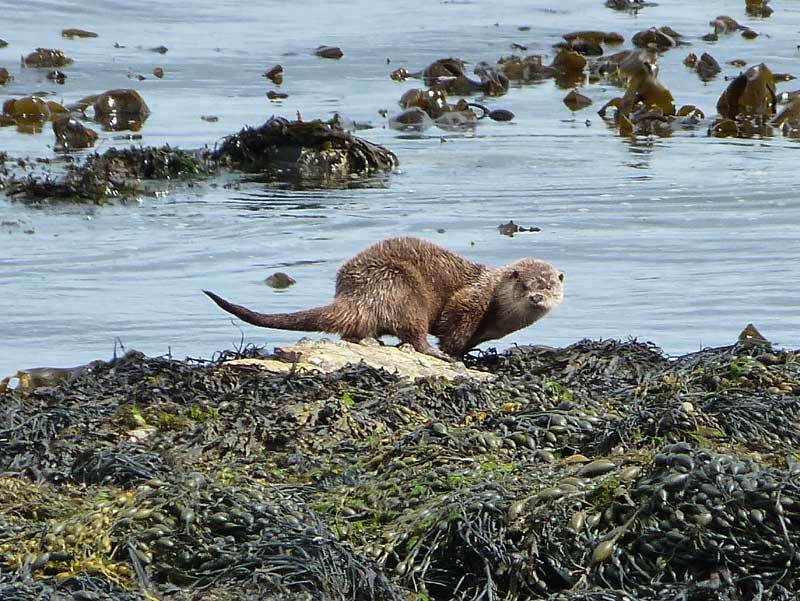 However, finding them is not made more difficult by this policy as practically every stretch of coastline on Mull could have otters, and finding them is made easier by the fact that the roads often follow the coastline. Otters tend to find their prey in amongst the seaweed, so look for that typical Mull shoreline where the seaweed is lapping against the rocks with the movement of the waves. You are most likely to notice an otter when it is fishing at sea or grooming on the rocks, but otters travel inland to get to their holts, lay-up areas, and to get freshwater. They can spend a lot of time resting on the shoreline in amongst the seaweed which is almost the same colour as they are, so you may not notice the snoozing otter that is only a short distance away. There are no rules that are set in stone, as an otter could be seen at any time of day (or night if it wasn’t too dark!) When otters live in freshwater they tend to be crepuscular, coming out at dusk and dawn, as this is when they can more easily find their prey. When living at the coast, as on Mull, otters fish at all times of day and night, and there is reason to think that the tides have an influence. It is thought that otters are more active, and hence more likely to be spotted, a few hours either side of low tide, and are more likely to rest at high tide. The weather can be just as important, if only due to the fact that if the sea is calm you are more likely to see an otter swimming on the surface while fishing. Bad weather does not deter the otter, who must continue looking for food. Otters spend a lot of energy keeping warm in the cold water (despite their amazing insulating fur), and at no point do they have reserves to call upon that would enable them to take a lot of time off from fishing. Best views can he had by walking or driving along the coast. You are more likely to see an otter when it is in the water, and normally they stay reasonably close to the shore. Other creatures can sometimes be confused for an otter, e.g. a glimpse of a bird diving under, or a seal. The tell tale signs of an otter are: it remains active, diving for an average of 20 seconds, and only pausing to eat its food, and when diving an otter normally presents the curve of its back followed by a flick of the tail. Otters can spend a lot of time on the shore resting or grooming. If they are sleeping among the seaweed, they will be hard to spot! If you are driving, then remember that your car makes a great wildlife viewing hide, so it is a good idea to stay in it! But if you get out, don’t slam the doors, and make as little noise as possible. If on foot, or outside of your vehicle – if you spot an otter, remain quiet and still. Don’t try and get too close to otters, as you will disturb them. They have a good sense of sight, sound, and smell, and if they detect you they will quickly disappear. Wear dull clothing, and ensure your silhouette does not appear above the horizon from the otter’s point of view. Be aware of the wind direction and remain downwind of the otter to prevent it from noticing your smell. If you must move then wait until the otter dives for food. A typical dive lasts for 20 seconds. Staying in one place is a great idea. Let the otter come to you, and if you stay still it may not notice you and could come really close. One way of determining whether otters are in the area is to go to high ground in a position which commands a view of a long stretch of shoreline. When you spot an otter from your vantage point, note the otter’s behaviour, and the direction it is heading in, and make your way carefully down to the shore, moving whilst it dives. Remember – don’t try to get too close. Below is an excellent video guide of how to spot otters by Simon King. Remember to respect the otters and other wildlife. Also show consideration for road users and other otter watchers. Please read our additional guidance on how to watch otters responsibly. Don’t forget to report your otter sightings to help with our vital research, which we hope over time will give us information on how the otter population is doing. In order to protect the data of reporters and the locations of otters the raw data remains confidential and is only known to our Chair person. Equipment? One doesn’t need to spend lots of money to watch otters, but a pair of binoculars would probably be at the top of the list of essential equipment. If venturing out of the car, then warm weather-proof clothing may well be needed along with some sturdy boots. Consider employing a professional guide. If you feel like getting some expert help, then there are plenty of professional wildlife tour operators on Mull. Good luck with your otter watching! And don’t forget to report your otter sightings to help with our research.